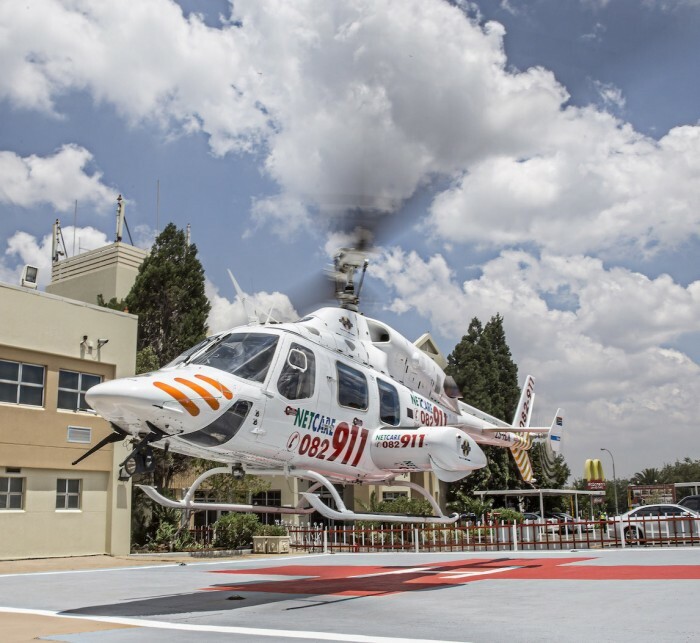 Netcare 911’s helicopter emergency medical service (HEMS) recently marked the first ’birthday’ of its two ICU-equipped Bell 222 UT helicopters, which have accumulated 804 hours of lifesaving service between them. Flying under the call signs Netcare 1 and Netcare 2, the helicopters transport critically injured patients from the scene of an emergency to hospital in the shortest possible time. The crew of the Bell 222 UTs comprise two pilots and an advanced EMS trauma team, including a specialised emergency care practitioner (ECP). Pretoria teenager, Carmen Botha, needed the speed and expertise of the HEMS recently after she fell 15 metres when a zipline at an adventure park snapped. Emergency care practitioner Jared Mc Dowall was part of the Netcare 1 helicopter crew who came to her aid. He describes how he and his colleague, Adrian King, fought to preserve the life of the critically injured teenager after she went into cardiac arrest three times during the flight between Hartebeespoort Dam and Netcare Milpark Hospital. They successfully resuscitated Carmen, who is now on the road to recovery, a testament to the axiom “time saves lives”. This is further borne out by statistics from Netcare’s accredited level 1 trauma centres at Netcare Milpark and Netcare Union hospitals, which indicate a correlation between HEMS intervention and improved patient outcomes. Regional operations manager of Netcare 911 HEMS, Deon Swart, explains that the purpose-built Bell 222 UT helicopter has a spacious interior and are fitted with the latest in diagnostic, ventilation and monitoring equipment, enabling the emergency medical crew to continue life-saving care throughout transit. Swart says that the air ambulances are called upon for a range of emergencies, including cases of serious road accidents, hiking accidents in remote areas and assault. It is also used for inter-hospital transfers of highly compromised patients. “We need to be ready for immediate action 24 hours a day, seven days a week. Once the dispatch of the air ambulance has been deemed appropriate by the Netcare 911 flight operations centre, the pilots and medical crew will be on board and ready for take-off within four minutes. Such is the demand for the Netcare 911 HEMS, that at times both Netcare 1 and Netcare 2 are called out to emergencies simultaneously,” Swart explains. Travel time to the scene of most accidents is between five and ten minutes, with Netcare 911 HEMS operating throughout Gauteng and neighbouring provinces. The helicopters are able to touch down at any safe landing zone, which requires a flat surface of 30m x 30m during daylight, or 50m x 50m at night. “One of the greatest advantages of HEMS, is that we can often land the helicopter closer to the patient than conventional ambulances. For accidents in mountainous terrain, for example, responding paramedics sometimes have to use quad bikes to reach the patient. Had it not been for HEMS, the patient would have to be carried down the mountain on a stretcher to an area accessible to an ambulance. This time-consuming and at times dangerous exercise could further comprise a patient and the emergency medical personnel,” Swart notes. The air ambulances are also extremely beneficial in emergencies involving spinal injuries, because they ensure a smoother journey. “Even when a patient is strapped to a spine board for support, bumps and potholes on the road can potentially exacerbate the injury. With HEMS, however, this risk is almost totally eliminated,” Swart elaborates. Shalen Ramduth, Netcare 911’s general manager of national operations, says that in the year since their introduction, the Netcare 1 and Netcare 2 helicopters had demonstrated the merit of aerial intensive care units in extending excellence in emergency medical care. June 2016 marks the 11th anniversary of Netcare 911 HEMS as one of the longest standing 24 hour flight EMS operators. “The real cause for celebration with the first birthday of these aircraft is that in just one year they have saved the lives of many patients, ensuring that they will be able to celebrate many more birthdays with their loved ones. This is in no small part attributable to the skill, dedication and enthusiasm of the HEMS crew,” Ramduth concludes.